Released in January 2018, the all new TOTO S550e Washlet is TOTO's newest bidet toilet seat offering, replacing the previous generation TOTO S350e. This TOTO washlet sports an all-new body design that is available in two styles - Contemporary and Classic. The difference between these two styles is the lid - the Contemporary style has a more minimalist and cleaner looking lid, while the Classic style has beveled edges going around the corners of the lid. Two different looks, but the same great washlet underneath. Equipped with both feminine and rear wash functions, this bidet seat offers outstanding cleansing performance. The washlet's built-in water heater provides a warm water wash at a temperature you control. Water pressure can be adjusted as well. The position of the spray nozzle can be adjusted more forward or more backward for optimal coverage. Using the oscillate feature will automatically extend and retract the nozzle, back and forth, providing a greater cleaning area. When done washing, activate the hands-free warm air dry to help dry off any residual moisture from your wash. Some unique features you'll find on the TOTO S550e include the automatic opening and closing lid. A body sensor on the washlet detects when you approach the toilet, and will raise the lid for you. Men - who may want to raise the seat too, can do so by tapping a button on top of the remote control. The washlet detects when you walk away, and will slowly close the seat/lid for you. The e-Water feature uses electrolyzed water to pre-mist your toilet bowl before using the toilet. This assists in keeping your toilet bowl clean with every flush. The remote control comes with an all-new design as well. Some of the buttons previously found on the sides of the remote have been moved to the front for easier operation. It is also a bit thinner, making it easier to hold in one hand. Two user-preset buttons can be found at the bottom of the remote which allows you to pre-program settings such as water temperature, water pressure and nozzle position for up to two people in your household. Here is a link to our official review of this washlet: bidetsPLUS' TOTO S550e Review. But you can continue reading below for some additional background on this bidet seat. The TOTO S550e washlet comes in your choice of two styles, "Contemporary" or "Classic" - which determines the type of lid your bidet seat comes with. Keep in mind this unit features an automatic open/closing lid, so your lid will almost always be closed. And because of this, the type of lid you choose has a huge influence on what your washlet will look like in your bathroom. The "Contemporary" lid has a cleaner, minimalist look while the "Classic" lid is busier - with beveled edges going around the contour of the lid. Once you get underneath the lid though, everything else is the same. The base unit and features are exactly the same no matter which style you choose, so it is strictly an aesthetic choice. The TOTO 550e washlet features both feminine and rear wash functions. Both water pressure and water temperature can be adjusted. The bidet has a tankless, on-demand water heater built right into the seat which provides a continuous warm water wash. You can adjust the position of the spray by adjusting the position of the wash nozzle more forward or backward. There is also an "oscillate" function which automatically moves the nozzle back and forth, extending the cleaning area. Also available, is a "wide" spray function which sets a larger radius for increased coverage. All of these features are controlled through the use of the wireless remote control. A wall mounting kit is included, so you can conveniently mount the remote on the wall next to your toilet. Buttons for the most commonly used features - such as wash, oscillate, stop and dry are all located on the front of the remote. On the back of the remote, you can adjust more advanced features such as the eco-power saving modes and strength of the air dry fan. Once you get your initial setup done, however - you'll be using the front of the remote 95% of the time. Most of the bidet seats you come across will have the basic features of feminine/rear wash, adjustable water pressure/temperature, adjustable spray, and warm air dry. What really sets this bidet seat apart though, are the non-wash features. These non-wash features are what really makes the TOTO S550e a "smart" toilet seat. Let's start with the automatic open/close lid. A body sensor detects when you're approaching the toilet and will raise the lid for you. And for men - tapping the button on top of the remote will raise the seat too. Both the seat and lid will automatically close when you walk away. The included LED night light turns on and off using this same body sensor. So the toilet lights up for you when you walk towards it, and dims when you walk away. We also note that you can customize these settings thru the remote control. So you can de-activate your lid from opening by itself, or de-activate the night light if you so choose. Then there's the eWater, or electrolyzed water feature. Electrolyzed water was originally used in the restaurant industry, used to disinfect knives, utensils and cutting boards. The TOTO S550e uses eWater to pre-mist your toilet bowl before you go to the bathroom. Pre-misting your toilet helps prevent material from adhering to the sides of the bowl, and increases flushing efficiency. The washlet then mists your toilet every 8 hours which further helps keep your toilet clean, and reduces the need for scrubbing your toilet with harsh chemicals. The heated toilet seat is another popular feature. Sitting on a freezing cold toilet seat is not the best way to start your day. The temperature of the seat can be adjusted as well, and of course - you can turn it off during the warmer months of summer. A built in air deodorizer is also included which works with active carbon filtration, helping to filter bathroom air of unwanted odor. An occupied seat sensor works as a "safety," which means none of the wash functions will work unless you are sitting on the seat. This helps prevent your three-year old toddler from accidentally activating the spray. This very well-thought out design and feature set makes this model one of the best bidet toilet seats available. If you're looking for the best seat money can buy, then look no further. The TOTO S550e is the washlet for you. What is the TOTO S550e? The TOTO S550e Washlet is an advanced electronic toilet seat, or "smart" toilet seat, which provides bidet functionality after using the restroom. It is equipped with both feminine and rear washes. It also includes a host of other features, such as a warmed toilet seat and auto open/close lid. When was it released? The TOTO S550e was released in January 2018, making its public debut at the 2018 Consumer Electronics Show in Las Vegas. TOTO's leading washlet now comes in two styles - "Contemporary" and "Classic" which features a different look in the style of the lid, to better match consumer tastes. Where is the washlet made? Although TOTO is a Japanese company headquartered in Japan, the TOTO S550e is actually made in Malaysia. Like other multi-national companies, TOTO realized cost efficiencies by moving some of their manufacturing plants offshore. Why would this model be a good choice? 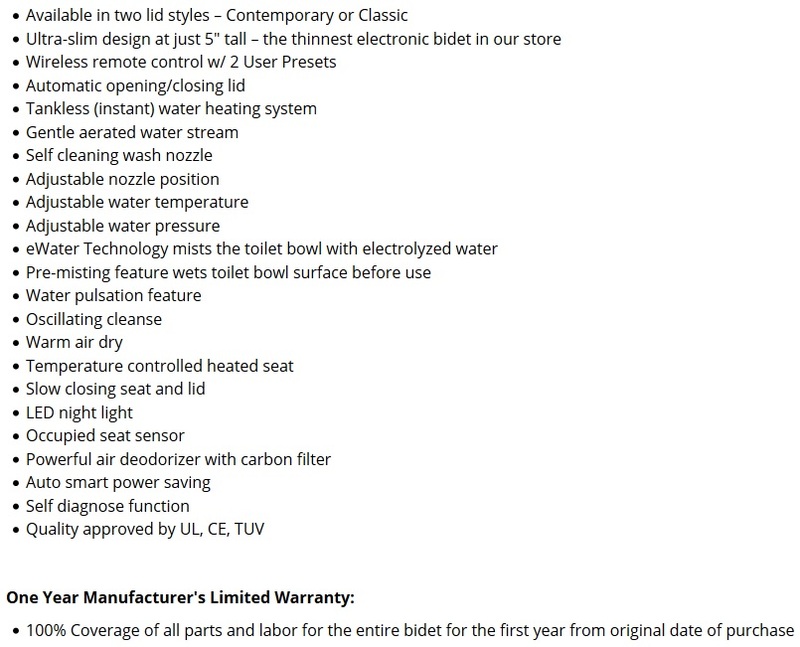 TOTO has been manufacturing bidet toilet seats since 1980. With nearly 40 years of washlet manufacturing experience, TOTO is widely considered as one of the best, most reliable brands in the bidet seat industry. The TOTO S550e is their flagship seat. It combines beautiful aesthetics with great washing performance. Who is the TOTO Washlet S550e best for? If you are new to bidet toilet seats you might take a look at all of the different models and feel like there are too many options to go through without getting overwhelmed. It can be hard choosing what the best option is for you when you are starting from a large number of choices, so we have narrowed down some of our top-sellers and customer favorites and tried to provide a bit more information to help you decide which model best checks all your boxes. Here in this section, we will tackle the TOTO Washlet S550e and why it may be the right choice for you. TOTO is the pioneer of the modern electric bidet toilet seat, so it is no surprise that they are probably the best-known brand on the market. The TOTO S550e is their flagship washlet so many people are immediately drawn to it just for the fact that it is the best model from the most recognizable brand. But aside from brand loyalty, the S550e comes equipped with some unique features that make it the best seat for some people. For example, it includes an automatic opening and closing lid feature that is triggered when you approach the unit. It also includes TOTO’s e-Water feature which uses electrolyzed water as a disinfectant that mists the surface of the toilet bowl to keep it clean. So, if the auto opening and closing lid is a key feature for you, along with the e-Water functionality and a slim design, then the TOTO Washlet S550e is a great choice for you. Besides these unique functions, the S350e is quite simply, in our opinion – the best looking seat you’ll find. As your eyes roll over the smooth, beautiful lines of this bidet seat, it truly stands out as a luxurious addition to your toilet. With other bidet seats, the lid only covers the seat-portion of the unit, leaving the back of the unit (and its indicator lights) exposed. The lid on this model however, completely covers the unit underneath providing a seamless look. The TOTO S550e is also the thinnest electronic bidet seat in the world. The maximum height of the washlet at the rear of the unit is just under 5”, whereas most comparable units are between 5.5” and 6” at their maximum height. The TOTO Washlet S550e is also unique in that it offers a choice in lid design. You can choose either the Classic design, which has a beveled edge on the lid similar to other previous models from TOTO, or the Contemporary design, which has a flat straight line design for a modern look. You also can choose between the standard Cotton White color or Sedona Beige. If you are looking for a beige color tone to match your bathroom, you would want to go with either the S550e, S500e or the Brondell Swash 1400 which all offer white or beige options. Now we will take a look at the remote control and how it is used to operate the bidet. The washlet is operated by a wireless remote control that is two-sided, with the most commonly used buttons on the front side and less often used features and settings adjustments located on the back side of the remote. The slim silver remote comes with a wall mounting kit so you can place the remote on a wall or surface where it is most convenient. There are nine primary feature buttons aligned vertically on the front of the remote with the rest of the functions and settings on the back side. Let’s first take a look at the front of the remote which you will using most regularly. The buttons on the front of the long slim TOTO S550e remote run up and down basically in one vertical column and are marked with small symbols rather than text, so we will just go button-by-button from the top to the bottom. The first button at the top of the remote is a small black square and this is the Stop button. As you might expect, you will use this to stop all features that are currently in operation. Next is the rear wash button noted by a dotted spray under an outline of a person’s backside. Push this to begin the posterior wash function. To the left you will see another dotted line spray symbol which you can press to change the regular posterior wash spray patter to a soft spray pattern in case you want a gentler spray. Under the posterior wash button is the feminine wash button noted by a dotted line spray pattern under an outline of a person sitting. This of course initiates the feminine wash function. Just like the posterior wash, there is a soft feminine wash option for a gentler spray pattern and the button is noted by a dotted triangle pattern to the right of the regular feminine wash spray button. The fourth button down on the front of the remote is for the drying function. Press this button that looks like three curved horizontal lines and the warm air dryer will begin and blow a warm stream of air to help dry off after washing. The next two buttons are for two different wash patterns. Directly under the air dryer button is an icon of a wash nozzle and below it a line with arrows on each end. This buttons operates the oscillating cleanse. This popular wash function will move the nozzle back and forth during the wash cycle so that a greater area is cleaned and a more thorough cleaning provided. You can press it again and the nozzle will go back to a stationary position. Next is the pulsating cleanse feature which is noted by an icon of a nozzle with a dotted spray pattern above the nozzle. Pressing this will cause a spray pattern that alternates from high pressure to low pressure for a pulsating massage-like affect. The next button also is noted by the nozzle icon and has two small stars over it. This is for the TOTO S550e’s nozzle cleaning function. If you want to periodically do a thorough cleaning of the nozzle to keep it sanitary you can press the nozzle cleaning button and the wash nozzle will extend and the unit will use electrolyzed water (also known as eWater) to sterilize the nozzle. Since the unit is set up to automatically clean the nozzle after use, you may not need to manually do this very often. The bottom three features on the front of the remote all have utilize two buttons that you will swipe towards to the left or right to make adjustments. First you will see a Minus (-) button on the left side and a Plus (+) button to the right. These are for adjusting the water pressure level. There are five levels, and swiping toward the minus button will decrease pressure and swiping toward the plus will increase water pressure. Next are an up arrow and down arrow, and these buttons allow you to change the position of the wash nozzle with the up arrow moving the nozzle farther forward and the down arrow moving it back. You can adjust the nozzle across five positons for both the posterior and feminine wash. Finally, the last two buttons at the bottom of the remote’s front side are the User Presets. These allow two different users to save their preferences for the nozzle position, water pressure and water temperature. There are two buttons that look like small outlines of people with a number 1 and 2, so you can simply swipe toward your number then press the wash function you wish to use. One last button we’ll mention here is actually located on the top end of the remote control. On the top right of the remote there is a small icon that looks like a toilet with the lid up and an arrow in front of a lid that is halfway up. Pressing this will automatically raise the toilet seat so you don’t need to manually raise the lid. The lid uses a sensor and automatically opens when you approach the toilet. This button on top of the remote lets you similarly raise the seat. The back of the TOTO Washlet S550e remote has a small display screen and below the screen is a keypad of buttons to navigate through the display screen. Use the arrow buttons (up, down, left and right) scroll through and highlight the different options displayed, and the black circle between the arrows acts as the Enter button to choose on option. There is also a Menu/Return button to go back in the menu, and a temperature adjustment button that has a small thermometer icon. The thermometer icon has a button of its own, since temperature settings tend to be something users will want to access more commonly. When you press this button you will see three categories to choose from with the up and down arrows: Water Temp, Seat Temp and Dryer Temp. Once you select the feature you will be able to adjust the temperature setting across five different temperatures from low to high. The water temperature and seat temperature can also be turned off by pressing the left arrow button until it says OFF. Moving on to the main menu - five categories are listed on the display screen when pressing the menu button (the button with three horizontal lines on it). The first category is Manual Cleaning. Under this category you can select the wand cleaning function which uses electrolyzed water to sterilize the nozzle or you can select manual cleaning which will extend the nozzle so you can manually wipe and clean the extended nozzle with a soft cloth. The nozzle will automatically retract after about five minutes. The second category is Energy Saver. This lets you adjust the settings for the power saving feature that limits energy consumption when the unit is not in use. The energy saver will detect times when the washlet is not generally in use and will lower the seat temperature or completely turn the heater off to save energy. You can also select the Timer Saver to have the unit turn off the seat heater for a six or nine hour period. The third category in the main menu is the Auto Function. You can select this category to make adjustments to some of the washlets automated features. For the automatic opening and closing lid function, you can adjust the amount of time before the lid closes or will open again after it has closed, and you can turn the function completely off you you like. You can also adjust on or off the automated wand cleaning which rinses the nozzle after every use; the bowl cleaning function which sprays a mist of water before and after use as a way to prevent material from adhering to the surface of the bowl keeping it cleaner. The deodorizer function on the TOTO Washlet S550e can also be set on or off under this category. The other automatic feature to adjust in this section is the light functions, including the soft light which is a small light to illuminate the bathroom with a soft light, the night light which illuminates the bowl area with a soft blue light, and the indicator light which tells when you the nozzle cleaning or bowl misting feature is in use. The fourth item in the main menu is for selecting the language in which the text on the display screen will appear. This will likely only need to be used the first time you set up your washlet. The fifth and final category is for Other Settings. Here you can choose whether or not you want the beep sound on when using the washlet or turn it off. You can also lock settings so they can’t be changed or unlock this function. Probably the function you are most likely to use from the Other Settings category is for setting the two user presets. Choose Personal Setting and then you can select Register 1 or Register 2, and then you will be able to select the preferred water pressure, water temperature and nozzle position settings for each user preset. What might I be missing with this bidet seat compared to others? Before you make a decision on any new purchase, most people will take a moment to go beyond all the selling points of a particular product and look at what that product might be missing compared with other brands or models. Here we will take a look at what the TOTO S550e is missing when compared with other similar bidet seats. The first thing that people often notice about the TOTO S550e is its higher price compared with other seats. If you are on a budget or simply looking for a good quality bidet without paying the highest price, then you would probably want to look at other options. Besides price, a functional difference of note is the lower spray volume on the S550e. While the wash spray is sufficient for most, those looking for a stronger spray might want to consider the BB 2000 from Bio Bidet. And while the S550e does include an automatic opening and closing lid, the lid is not weight bearing so you shouldn’t sit on the closed lid. If having a sittable lid is important, the Brondell Swash 1400 would be a good option. The warranty is also a bit weaker than other brands as there is only a one year manufacturer warranty included. Several other models offer three year warranties or have options for extended warranties. The last thing to nitpick about the S550e is that TOTO is still using plastic nozzles rather than stainless steel nozzles. If you’ve never had a toilet automatically open the lid for you, it’s hard to grasp how useful the automatic opening/closing seat and lid feature is. A lot of people may look at this feature, roll their eyes, and think it’s not that hard to put the seat/lid up. But imagine if every time you walked thru the front door of your house, the door automatically opened for you. And after you walked in, the door automatically closed behind you. Every time. You wouldn’t have to put your groceries down as you fumble around for your keys. You wouldn’t have to touch around blindly in the dark. Certainly, the automatic opening lid on the TOTO S550e is cool. And your house guests will be quick to ask how your toilet opens the lid by itself like that. But coolness and awesomeness aside, it really is a convenient addition to your life. And even better – it’s hands free! You don't need to touch the toilet with your hands to go to the bathroom. Think about that. For men, tapping a button on top of the remote raises the seat too. And when you guys are done, simply walk away and both the seat and lid will automatically close. And the best part? Your wife and your daughters will always find the seat down. The The TOTO S550e is a luxury bidet toilet seat with many high-end features that make it an attractive option for those looking for a top-of-the-line washlet with all the bells and whistles. It’s also excels in the “looks” department and is arguably the best looking bidet seat available. The automatic opening and closing lid plus the e-Water sanitizing feature add an extra level of luxury to this fully featured model from a leader in the industry. The slim body and lid design options also give this washlet an added esthetic appeal. While the price is a bit more than other bidet seats, those looking for the best seat from the most well-known brand in the business will find a lot to like in the TOTO S550e. Q: How does the S550e differ from the S500e model from TOTO? A: While the S550e and S500e have the same physical appearance and many of the same functions, the S550e has a few additional features. First, the S550e has an automatic opening and closing lid. The seat can also be raised and lowered by pressing a button on the remote. The S550e also has an LED night light for easier use at night that is not available on the S500e. Q: What is the difference between the Contemporary and Classic version of the S550e? A: The Contemporary and Classic and versions of the TOTO S550e simply have differently designed lids, so the difference is purely aesthetic. The Contemporary design – sometimes referred to as Modern – has a flat, straight edge lid. The Classic design has a beveled edge lid. Q: What is e-water and how does it work? A: TOTO’s e-water feature charges sodium ions in the water supply which works as a sterilizing agent. 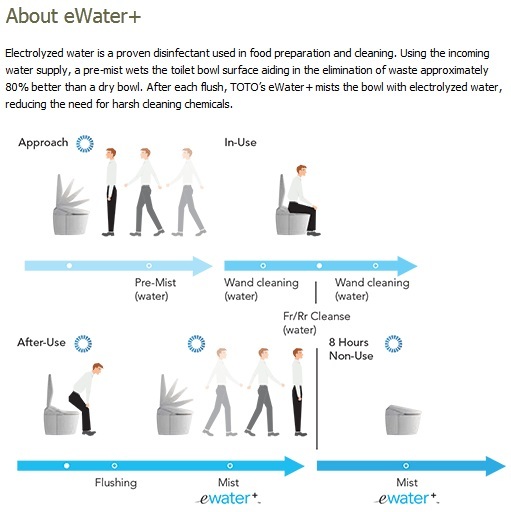 E-water, or electrolyzed water, is commonly used to clean utensils and cookware in restaurants because it is an efficient way to disinfect without leaving any sort residue from a chemical cleaner. The S550e uses e-water to clean the wash nozzle and also in its bowl misting function. The S550e sprays a mist of e-water before and after each use to keep material from adhering to the surface of the bowl and limit the need for manual bowl cleaning. Q: How big is this bidet seat? A: The S550e has a narrower profile than other bidet seats with a maximum height of 5”. Other models range from 5.5” to over 7” tall, so the S550e (as well as the S500e) do offer a slimmer look than other bidets. Q: How does the automatic lid operate? A: The automatic lid on the TOTO S550e works by using a body sensor that is activated when you approach the unit. Once the sensor is activated, the lid will automatically raise and stay up while in use. When you leave the vicinity of the unit and are out of range of the sensor, the lid will then automatically go down and softly close. The feature can be turned off if you ever want to deactivate it. There is also a feature that raises the seat by pressing a button on the remote so you do not need to manually raise the seat. Q: Does the S550e need to be installed on a TOTO toilet? A: The S550e like other bidet seats will fit the vast majority of toilets regardless of make or model, so you do not need to have a TOTO toilet to install a TOTO bidet seat. You do want to make sure you have at least 1.75 inches of clearance from the mounting holes where the seat attaches to the front of the water tank. The S550e is an elongated size bidet seat, so you would want to make sure you install it on an elongated size toilet. Q: Will I need to hire a plumber to install this? A: The bidet seats that we carry go directly on your existing toilet and they are all DIY (Do-It-Yourself) installation, so a professional plumber is not required. To install, you would first remove your existing toilet seat and then secure the TOTO S550e mounting bracket (the unit comes with all the installation hardware included). The washlet slides in and locks in place on the mounting bracket, and then you connect to the water line already connected to your toilet tank using the bidet hose and T-valve connection included. Once everything is connected, you simply plug it in and it is ready to go. Most people do the installation in about 30 minutes. A: The power cord on the TOTO S550e in on the rear left side of the unit as you are facing it installed on your toilet. The power cord is 3.5 feet long. Q: Does the S550e use water filters or air filters that I need to change? A: No, the S550e does not have any filters that need to be changed. A handful of other bidet seats have air deodorizer cartridges that need changing, but the filters are specific to only those few seats. It should also be noted that the external water filters that we carry are NOT compatible with the TOTO seats, so the water filter accessories are not necessary and do not work with the TOTO models. Q: Is the remote control difficult to use? A: The remote control for the S550e is actually quite easy to use. It is a two-sided remote, so the most common functions you will be using are on the front side for easy access. The back side has a small display screen menu and is where you can adjust settings or turn features on or off. After the initial installation and setup you generally don’t need to use the back side much if at all. Having a two-sided design makes the front easier to use since it isn’t overly crowded with buttons and it has a sleeker look. Q: What should I use to clean the S550e? A: It is best to avoid using cleaning agents that use caustic chemicals because they can cause discoloring or leave marks on the surface of the unit. Rather than using harsh chemicals like bleach or cleaners containing benzene or acids, it is recommended you use mild soap with water and a soft cloth or non-abrasive sponge to clean the bidet. You can also use “green” cleaners which do not contain harsh chemicals. Q: Can someone use the seat without using the washing functions? A: Yes, the washing functions will only operate if the user activates a wash feature by pressing the remote control. If a guest would rather not enjoy the bidet, they can simply use it as a regular toilet seat. Last year I had two arm surgeries that prevented me from using my hands, one hand at a time. I had no ability to remove my clothing to take care of business. I even had to get someone to wipe the potty path. Lost dignity! Lost sense of independence! I also found who would really help me when the circumstances changed, certainly not who I expected! I decided I am never going to be in that precarious position again so a Toto Washlet was installed in the master bathroom. The spray can be moved forward or back as needed. I can swipe my finger across the remote for the exact process needed. I can bathroom all by myself again! The automatic lid startles the dog. A little confusing at first but after a few visits I understood. They could use a quick start guide. The heated seat was alarming to me, if felt too hot at the default setting (3) so I turned it off. My spouse turned it back on to a level 1, which is fine. Bottom line is that I highly recommend this Washlet even though the price is high. This is a quality product. Ideally the price would be lower and no one would ever need surgery of the hand/wrist. We used these while we were in Japan and loved them! Our friends also have this brand and have been very helpful when it came to choosing a bidet. We love it and are so glad we made this purchase. Bidet with all the features! This bidet does it all... and with remote control it is so easy to install. It was easy and a do it yourself type of thing. Love the warm seat on cool evenings. Two of my friends bought one after trying mine. Very happy with my TOTO washlet S550e. Can change spray position and the water temperature and water pressure so washing can be really customized. A big improvement over toilet paper and although I was skeptical at first my toilet paper use has really gone down. Plus it's a really nice looking washlet which makes my toilet look fancy and high-tech. Never thought this Washlet would exceed my expectations. Contemplating shoulder replacement and this is the perfect answer to personal hygiene when your regular routine will be upset. A long time Toto user, I was pleased to see that all previous functions are still there, but the auto cover opener range has been shortened. Now you can walk nearby without setting it off!! Very smart and intuitive. I love the features. I lived in Japan for 5 years and saw these a lot. Once you use one, you hate anything else. I got this model because it had all the bells & whistles. Everyone that visits, loves it. I bought one of these Toto bidet seats after using one in California. It is fairly easy to install except for one big problem. The seat's adapter fitting would not stop leaking until I bought some brass washers and even then, I really had to wrench it tightly. I'd given it 5 stars if the install wasn't so problematic, because the seat works beautifully and I'm glad that I have it. This product is everything the reviews say about. So far it has worked flawlessly. First bidet toilet seat and would highly recommend it. Keep in mind that you will need electric power nearby. Otherwise easy to install. So glad we decided to purchase the S550e. It may cost a little more than other bidet seats, but it is absolutely worth it. Installation was not that hard (we did have an electrician install an outlet, but it was worth getting it done right). Toto has the knowledge and experience to build the best bidet seats and we love all the features. We haven’t found anything we dislike about this seat. Totally worth it. life is too short to not own a TOTO! I've grown up using washlets outside of the USA. It wasn't until i got around to remodeling my bathroom that i decided to get a TOTO at home. BEST decision ever. Bidets Plus was very fast, item was at my house the next day. Toto's secret feature, odd sensor. I recently bought a Toto S550e to replace a Toto S400. While this new seat has many useful features, it also has one major flaw and one hidden feature. The flaw is in the choice of sensor to detect a person approaching the toilet. In the S400 this sensor uses infra-red radiation to detect movement, the S550e seems to use radio waves. This seat is installed in what used to be a closet under the stairs and we frequently walk past the door. Often, but not always, when we pass this closed door the seat lifts up and the bowl is sprayed with eWater. In the troubleshooting section of the manual it tells us to turn off these features if this is a problem. Having just paid good money FOR these features it is insulting for Toto to cover up their poor design decision with this instruction. Infra-red detectors do not have this problem as IR does not pass through doors. I think this choice was made for aesthetic reasons, to eliminate the dark red transparent plastic window need for an IR sensor. When looking over this seat before installing it I popped off the cover over the water filter. Just behind the filter there is a socket, just like the socket on the back of S400 for connecting the auto-flush motor installed in the toilet tank. After installing the seat, I wondered if the old remote control for the S400, which was still installed, would work with the S550e. It did. It cannot control all of the settings, but can operate the basic functions. I decided to connect the flush motor to the seat to see what would happen. There is a small plastic part which has to be pulled out to insert the plug. This part, when in place, prevents the plug from loosening. Pressing the Flush button on the remote caused the flush motor to turn, but in the wrong direction. I followed the instructions in the motor installation manual to reverse the motor direction and it worked. Then I turned on Auto-Flush with the remote and it worked, too. I don’t use auto-flush because it generally flushes before I am ready, but pushing a button to flush is convenient, especially since the wide button on the top of the old remote can be pressed with an elbow when one is ‘reinstalling’ ones clothing. I had noticed a small catch at the top rear of the new remote. Intrigued, I pushed it and the top, an IR window with one button to raise the seat, popped off. Inside are three buttons. Pressing the other two revealed that each operated the flush, one in each direction. This eliminates the need to reverse the flush motor, as mentioned above. Just use the correct button. I reversed the direction using the old remote and then the other button flushed correctly. Even though the reversing method is not need with this new remote, it is still built-in. The plastic button covers for these flush buttons could not be pressed down, so I pushed little tabs that hold them into the frame to remove them and discovered that the Flush button covers had a very small ridge (about 0.5 mm) underneath, around the perimeter (segmented, not continuous), but the Seat button cover did not. This ridge prevented the covers from moving down. I carefully sliced this ridge off one of these covers, and now I can flush the toilet with the new remote. This flush function as not an add-on, it is fully integrated into the programming of this seat, as I accidentally discovered. I pushed the Flush button just after the eWater bowl spray began, and it stopped spraying. About ten seconds later the spraying resumed, presumably to prevent the eWater being flushed off the bowl too quickly. If the wand cleaning has begun, it is also stopped when flushed, but it starts again just after the flush. For those interested in this feature, the flush motor is still available for about $79. It’s model number is THU695#CP. Toto makes no mention of this feature in their online info, brochures, or the user manual. It is a secret. Why is this? Toto should provide instructions on how to use the new remote to turn Auto-Flush on and off. They should also make replacement flush button covers available for the remote, complete with a Flush symbol (or text), so that the installer can replace the appropriate cover. Great update to the WASHLET line! I ordered this S550E after using TOTO's S300e for a few years and I'm happy with this updated version! Many of the features are arguably unnecessary but are really nice once you get used them! For example, this bidet has a built-in night light, heated seat, and motorized lid and seat which are all handy conveniences that make using the bidet more enjoyable. - It's the smallest, sleekest bidet seat I've found and doesn't look giant when installed. It's nice to have multiple styles and colors to choose from to match your bathroom. - Most of the automatic features are customizable. You can adjust water temp, pressure, nozzle settings and more all to your liking rather than just on/off. - The instantaneous hot water feature means you'll never run out of hot water, unlike some tank-style bidets. - The new, redesigned remote uses touch-sensitive buttons on the front so there are no moving parts to wear out it’s a flat surface that's easy to clean. - I wish the energy saver settings would support a more detailed daily schedule or a 7-day schedule. - There's an audible click from the safety switch whenever you sit on the seat. Not a big deal but it's noticeable. - I love the e-Water feature and wish I could trigger it manually from the remote control. - I haven't found a way to disable the "tinkling water" that drains from near the nozzle into the toilet bowl whenever someone sits on the seat (aside from shutting it off entirely.) I believe it's intended to be a nice feature that drains the small amount of cold water from the nozzle so it's ready for use, but I wish that it could be customized so the bidet doesn't come-to-life when someone sat down who doesn't intend to use it at all. Overall, I’d say that it’s a luxury product that has become a welcomed addition to my house. I was planning to order from Amazon like I did for the previous model but Mark from bidetsPLUS provided more helpful information than I could even get from TOTO and the price was cheaper here than anywhere else I could find. I first experienced a bidet seat during a Tokyo layover several years ago. In the words of Will Smith in Independence Day, "I have to got to get me one of these." I had a Bio Bidet seat in my house in Virginia, and the seat was great, though a bit bulky. Two years ago I moved to coastal Georgia and installed a Bio Bidet 2000 seat. Again, terrific product. Fast forward to September 2017 and my house is devastated by Hurricane Irma. I had to take it down to the studs to rebuild and the knuckleheads doing the demolition essentially destroyed the Bio Bidet seat. As I shopped around for a replacement I came across reviews for the Toto S350e. I'd installed Toto toilets in my house and I know what a quality product they make. The S350e was about $240 more than the BB-2000 but I decided to splurge because of the added features the Toto product has. I placed my order online through Bidets Plus, using their great new customer discount, which saved me close to $100 on my order. Shortly after I placed my order, I received a phone call from Bidet Plus customer service informing me that the S350e would not be back in stock for several weeks. In its place I was offered the new S550e. Though the 550 was a bit more expensive than the 350, Bidets Plus said they would give it to me for the original price I'd paid for the 350. You cannot beat customer service like that. The bidet seat arrived quickly and was simple to install. It takes no great plumbing skill to put it in. If you can screw in a light bulb, you ought to be able to install this seat. The only difficulty you might run into is if you don't have an electrical outlet handy. I'd had one installed by a licensed electrician when I'd installed the original seat. The seat works perfectly. I still have contractors working on the house and they freak out every time the toilet lid opens automatically. My cabinet installer thought the house was haunted. I am not making this up. Anyway, the seat might be viewed as a bit of an extravagance, given the nearly $1000 price tag, but it is well worth the splurge. We had to be out of our house for six months while it was being rebuilt and the worst part of that ordeal was not having a bidet seat. Trust me, once you've used one of these, you can't go back to the old way of taking care of business. It's like Jerry Seinfeld said, "once you've flown first class, you can't go back to coach. I can't. I won't." Be kind to your behind and take the plunge. You'll be very glad you did. This seat is the best.